CEREX Air- impingement toasters offer state of the art finished product quality not only for toasting but also for drying of various granular products and puffing of extrudate pellets. The impingement technology provides optimal airflow-product contact conditions. The conveyor size is engineered to allow for a gentle heat transfer. 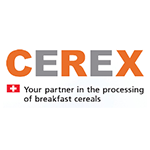 In combination with the CEREX fines separation system, unsurpassed energy efficiency is achieved. CEREX impingement toasters fit into any building as it is the industries most compact system without compromising the final product quality.